If you are looking for an affordable and comprehensive all-in-one solution for your home office Epson Workforce Pro WF-3720WF is a good option. It has advanced features such as wireless connectivity, automatic duplexing, a touchscreen and more to let you enjoy all at once, as a means to support your business seamlessly. The compact 4-in-one machine weighs 8.4 kgs with the dimensions corresponding to 425‎ x 378 x 249 mm (Width x Depth x Height). It features a 6.8 diagonally configured touchscreen that enables direct navigation over all the functions. The printing resolution is 4,800 x 2,400 DPI whereas the scanning resolution is 1,200 DPI x 2,400 DPI (Horizontal x Vertical), both being high-quality. The scan-to feature allows you to scan to email, Cloud, FTP and Network. The device can print black and white text at a speed going up to 20 ppm and colour print at a speed going up to 10 ppm. The Epson WorkForce Pro WF-3720DWF ink cartridges are placed in a configuration that allows you to replace only the colour used. It offers both wired connectivity and wireless connectivity. 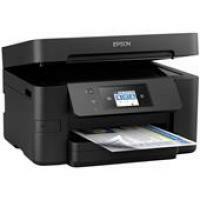 It has options including WiFi, WiFi Direct, NFC, and Epson mobile applications to print remotely from anywhere. A 35-page automatic document feeder and front paper tray with a capacity of 250 sheets are enough to meet your office workload. The device is compatible with Windows and Mac operating systems. The 4-in-one device offers business-quality printing, scanning, copying and faxing capabilities. Moreover, it has flexible wireless options, automatic duplexing and ADF. Epson WorkForce Pro WF-3720DWF ink cartridges are available in XL size which makes the operations more cost-effective. All-in-all, it is an effective deal for home office users. How to print with the expended colour cartridges? Using expended colour cartridges mean you can temporarily continue printing from your computer using black ink. But you will soon need to replace the expended colour Epson WorkForce Pro WF-3720DWF ink cartridges for future printings. Note: Printing cannot be performed with expended colour using the Epson WorkForce Pro WF-3720DWF printer’s control panel. Step 1: Epson status monitor must be enabled for using this feature. While a colour cartridge is expended, you cannot print faxes, make copies, or print from Epson Connect or a mobile device. If a message while printing displays that temporarily print can be done in black ink with an expended colour cartridge, you can cancel your print job and select settings to print on plain paper. To cancel your print job, click on cancel or cancel print button. Load plain paper in the tray and go to the print settings. Click on the main tab and select the plain paper or envelope as paper type setting option. Select the black or grayscale checkbox and click on the OK button. Click on the print in black option and then try to print your document. Click on the Epson WorkForce Pro WF-3720DWF printer’s icon in the menu. If a message displays that temporarily print can be performed in black ink with an expended colour Epson WorkForce Pro WF-3720DWF ink cartridges, click on the delete or cancel button and cancel your print job. Select system preferences in the menu. Select the driver or other options. Click on the option to permit temporary printing through black ink. Then click on the OK button and close the window. Load the plain paper in the paper tray. Select plain paper as the paper type setting for printing. Select black or grayscale checkbox and click on the OK button to print the document. Q. I am looking for a printer which provides good printing speed. Will Epson WorkForce Pro WF-3720DWF printer fulfill my requirements? A. Yes, of course! This Epson printer has an optimum printing speed of 20 ppm and 10 ppm for grayscale and colour printouts respectively. To enhance its speed the printer is backed with an automatic document feeder, which saves time and paper. Besides this, the printer offers high printing resolution of 4,800 x 2,400 dpi, which is good enough to deliver business-quality prints. Q. I want a black Epson WorkForce Pro WF-3720DWF ink cartridge for my printer. But, by mistake, I had ordered the wrong ink cartridge. What should I do now? Do I have to pay an extra charge for the replacement of ink cartridges? A. To replace the ink cartridge with the correct one, please fill the Order and Return Form. Our team will contact you soon and provide you with the required product. Do not open the ink cartridge packet. Also, there is no extra charge if you make another purchase. Q. I want to know some details about the site and the quality of the product that you are supplying. To whom should I contact for this? Thanks in advance! Q. I had mixed the ink of compatible Epson WorkForce Pro WF-3720DWF ink cartridge with the genuine one. Would it affect my print quality? A. Yes! It is recommended not to mix the ink of compatible cartridge with the genuine one as it will not only affect your print quality but will also void your printer's warranty. Q. Do you provide good quality compatible Epson WorkForce Pro WF-3720DWF ink cartridges? A. Yes, we provide good quality ink cartridges. Our ink cartridges follow ISO Standard and are FCS Tested and certified.